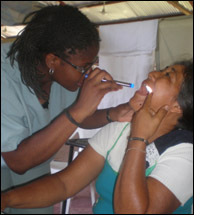 I had the opportunity of being part of a group of medical doctors, pharmacists, nurses and medical students who went on a mission trip to Honduras to provide medical care to individuals in underserved areas. The first three days of the trip were spent in La Hicaca, a rural area in the mountains of Honduras. Clinics were set up in classrooms at the community center where people of various ages were able to seek medical attention. As part of the medical team, I was able to provide medical care to these patients, some of whom did not have easy access to medical care for various reasons, which included their socioeconomic status and the lack of proximity of clinics or hospitals to their residential areas. In addition to providing medical care, patients also received diabetic testing and counseling, handouts with exercises for management of osteoarthritis and muscle strains, and antihelminthic medications for treatment and prevention of parasitic infections. These interventions not only provided some patients means of short-term symptomatic relief, but also educated them on habits that will help minimize symptoms and/or prevent medical complications. During the second week of our journey, clinics were set up in a church in a town named Coyoles. Our care for the patients was similar to La Hicaca. Overall, some of the patients' needs were met. However, there were few occasions where I felt disappointed by the fact that I was limited in my ability to provide more resources for patients. For example, I encountered an elderly female with an elevated blood pressure in the 190-200/90 range (normally, it should range from 90-120/40-80). Given our limited resources and the short duration of our trip, I was limited to counseling her on diet and exercise as ways to lower her blood pressure, health risks associated with high blood pressure, and the need for medical attention at a local clinic for a follow up visit. I wanted an opportunity to see her at a later date for a follow up visit to recheck her blood pressure and institute antihypertensive medications if indicated. This medical mission was rewarding because it was an opportunity to treat minor acute or chronic illnesses, as well as educate patients on ways to improve their health. It also taught me how to make the best use of limited resources to meet patients' needs.